Buy Did Bach really mean that? Did Bach really mean that? is published at £36.50. Please order from Soundboard Records. 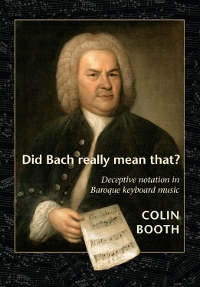 For a limited period, everyone buying a copy of Did Bach Really Mean That? from Soundboard Records will receive a complimentary CD of Colin Booths recording of Bachs Goldberg Variations (normal price £10).